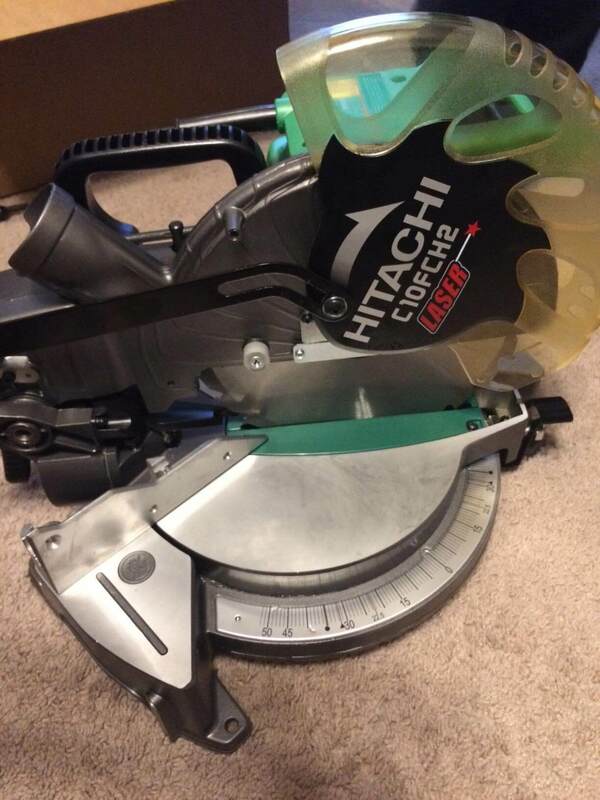 Review of Hitachi C10FCH2 15 Amp Miter Saw:How good is it really? 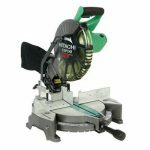 →Review of Hitachi C10FCH2 15 Amp Miter Saw:How good is it really? 7.1 How good is the laser? 7.2 Anything not to like about the Hitachi C10FCH2? Need a lightweight – but incredibly durable – 10 inch miter saw that performs well for the price? Then you need to consider the Hitachi C10FCH2 15-Amp 10 inch Single Bevel Compound Miter Saw with Laser. Hitachi designed the Hitachi C10FCH2 for versatile, easy use. The thumb-actuated positive miter stops allow for simple miter adjustments between zero and 52 degrees. 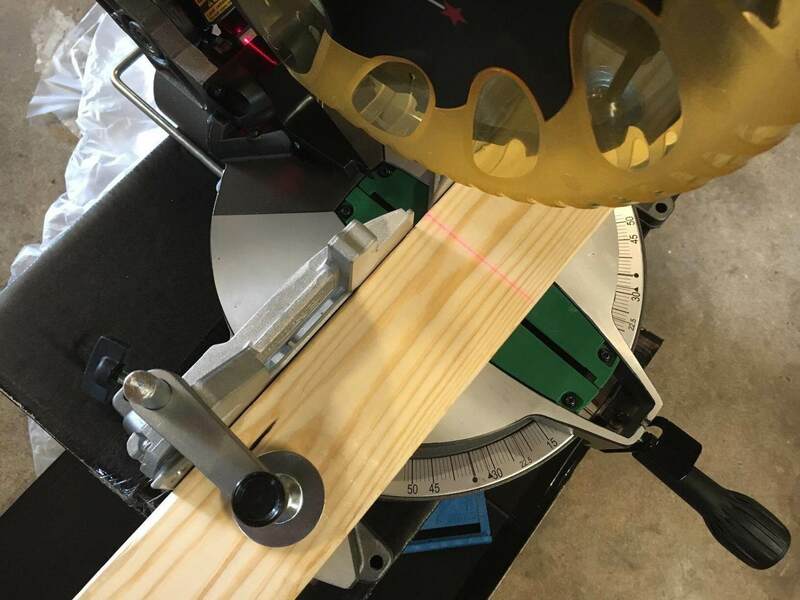 This design allows you to easily change the angle of the cutting blade for creating miters in crown molding and other trim pieces. And with a bevel range of 45 degrees to the left, the Hitachi C10FCH2 provides gorgeous bevels on the first try. The 10-1/2-inch tungsten carbide-tipped (TCT) saw blade (included) makes easy work of delicate trim and other woodwork, and the large extended flip fence raises to four inches to allow for accurate cutting of large work-pieces up to 2-5/16 inches high and 5-21/32 inches deep. Hitachi equipped the Hitachi C10FCH2 with its exclusive Laser Marker System, which can be activated before the blade is in motion for exact alignment and predictable blade placement. 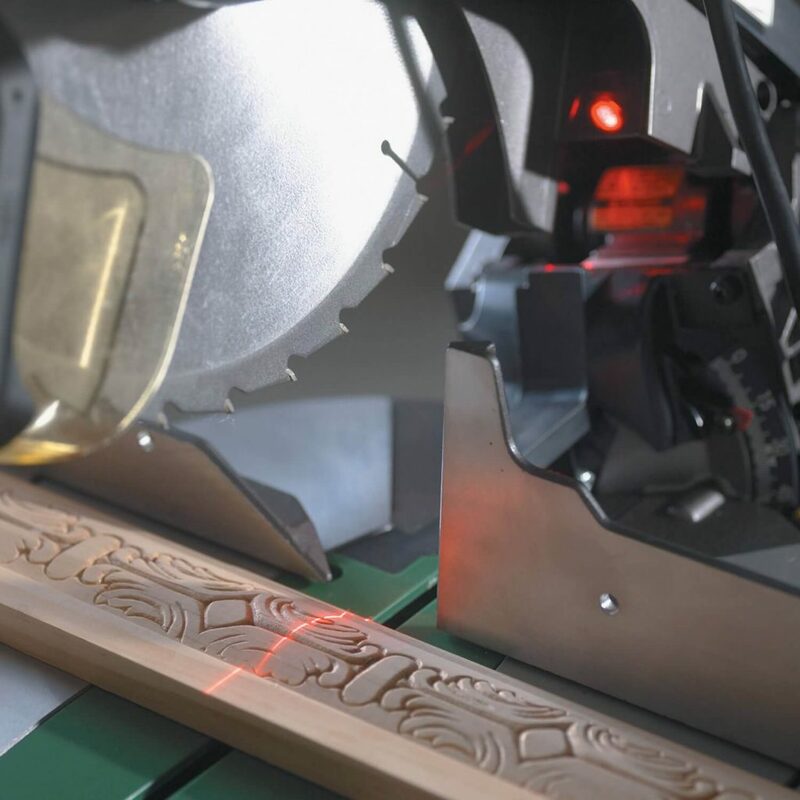 Simply line up the laser with your mark on the work-piece, and the saw blade will make an exact cut along the laser guide. As long as your measurements are right, your cuts will be, too! The Hitachi C10FCH2 Has plenty of features to Help you make the perfect cut the first time. To start, a 15-amp motor generates a no-load speed of up to 5,000 RPM for making crosscuts and miters with ease, even on the toughest cutting jobs. For ease of use, a comfortable Horizontal Handle with a vibration-reducing elastomer grip keeps you in control at all times, a large table provides a stable guide and sturdy support, and a built-in clamping system holds your work-piece in place. The Hitachi C10FCH2 also includes a dust collector that minimizes accumulation of dust and particles in your both your work space and the saw’s interior components, keeping your job site clean and prolonging the life of the tool. An added bonus, easily accessible carbon brushes will help your saw perform for the long term. First and foremost, reviewers were impressed with the weight – or, rather, the lack of weight! Several of them mentioned how portable this saw was when paired with miter saw table, along with how easy it was to store when they weren’t using it. Some miter saws are so heavy that you need a special shelf or a lot of space to store them in. Luckily, the Hitachi C10FCH2 doesn’t fall into that category. According to reviewers, another big perk to this saw was the clamps. Several reviewers said that Hitachi’s clamps were better than any other brand. Thanks to the clamps on the Hitachi C10FCH2, your Hands aren’t anywhere near the actual cutting. That way, you won’t fall victim to kick-off pieces. A few reviewers pointed out how nice it was to not get hit with anything – even anything tiny – while they were cutting. Reviewers also loved the thumb-activated miter stops. They said having the saw designed that way made it easier to use – and made projects move along faster. How good is the laser? According to reviewers, it definitely lives up to the Hype and is seen as a good 10 inch miter saw by many users. Most reviewers said that the laser on the Hitachi C10FCH2 is surprisingly accurate – even right out of the box. In its sales pitch, Hitachi promises, “as long as your measurements are right, your cuts will be, too,” – and reviewers wholeheartedly agree. Anything not to like about the Hitachi C10FCH2? According to the user reviews we read, there are a couple of things that owners weren’t totally thrilled with. The biggest complaint centered around the blade – more precisely, changing it. 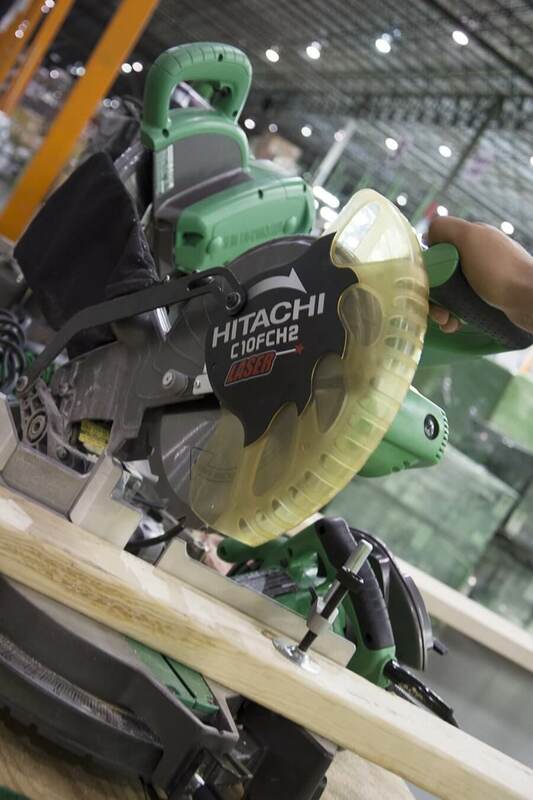 According to reviewers, the blade that comes with the Hitachi C10FCH2 is fine for rough cuts. 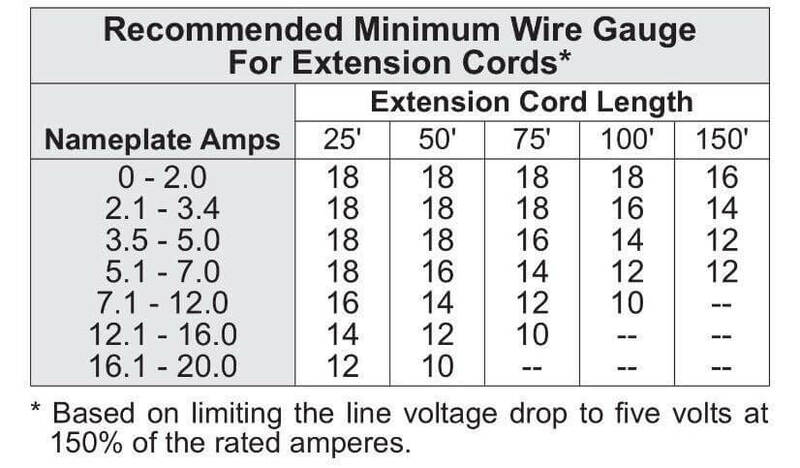 However, several reviewers suggested replacing it right off the bat if you’re planning on doing any super-fine cuts. The only problem is that it’s tough to replace. According to reviewers, the blade guard lock is very tight, and you have to hold the saw awkwardly to remove the existing blade. That being said, though, none of the reviewers we heard from said the problem was big enough to make them regret their purchase. And, as is the case with most of the miter saws on the market, the dust collector on the Hitachi C10FCH2 could work a little better. Some reviewers pointed out that they avoided a mess by connecting a shop vase directly to the Housing. As an added benefit, it also prevented the port from clogging. Another slight disappointment- The instruction manual. In what seems to be a Hitachi tradition, the instruction manual for the Hitachi C10FCH2 is tough to understand. Luckily, this saw doesn’t need a whole lot done to it when you pull it out of the box. Most reviewers were able to figure out how to install the sliding fence and attach the dust collector all by themselves – and it only took them a few minutes to do. The Hitachi C10FCH2 15-Amp 10-inch Single Bevel Compound Miter Saw with Laser Marker comes with an awful lot of bells and whistles, but doesn’t cost you an arm and a leg. If you buy this saw, you’re going to get a solid, easy-to-use miter saw that you can use for years to come. 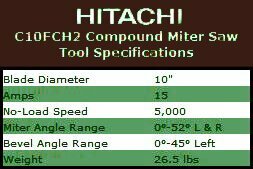 Get Hitachi C10FCH2 15-Amp 10-inch Single Bevel Compound Miter SawBuy on amazon now!